Here is one day in May where color, shapes and sounds announced new life in West Virginia. The natural cycle continues. As of the end of the month, with the squeaking song in early morning of the Indigo, all of the migratory birds have returned. We are ready for summer. My artist eye looks for shadows, highlights and textures to exaggerate. When you look around what catches your eye and how will you show us the results? This entry was posted in elements and design in art, farm life, Fiber Musings, West Virginia Artists and tagged farm life, Jim Lilly, Susan L. Feller, west virginia on May 30, 2016 by Susan L. Feller. We added Speckled Sussex and Golden Polish chicks this spring to the barnyard. In the order Murray McMurray included an extra chick which has grown into a MALE Hamburg. So we have TWO roosters for 17 hens. Trust me that is at least ONE too many and the girls think it is 2 too many. BUT they both look spectacular, so who ends up in the stew pot? Stay tuned. In the mean time, with this variety we learned each breed has an identifiable voice along with feather pattern, and leg colors. It is a chorus of clucks and chirps when we feed. See if you can match the legs with feather patterns selecting one from column A and one from B. Answers below the gallery. This entry was posted in elements and design in art, farm life and tagged chickens, farm life, Ruckman Mill Farm, Susan Feller on December 6, 2013 by Susan L. Feller. We are live with an updated site! 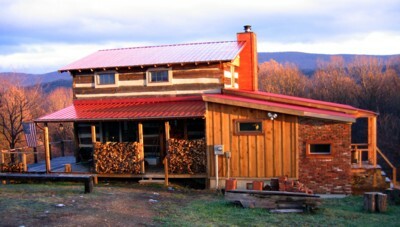 If you clicked onto this blog through http://www.ruckmanmillfarm.com welcome! Look around the posts and pages to learn even more about Susan Feller and Jim Lilly at home in the Mountain State of West Virginia. We are thrilled to have an official logo honoring the log home Jim built and the era of time we both are reliving… the Arts and Crafts period of the early 1900’s. Michael Anderson is our graphic designer, web creator, fellow artist, and friend. I have found him to be easy to discuss concepts with and the magic in cyberspace he has worked should make your visits enjoyable. Let us know of any problem, difficulty or enjoyable clicks while on the site, so we can improve it. 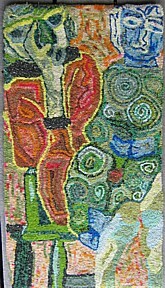 This entry was posted in farm life, hooked rugs, textile art and tagged advertisements hooked rugs, farm life, fiber artists, Ruckman Mill Farm, Rug Hooking Magazine, Susan Feller, Susan L. Feller, west virginia on March 18, 2011 by Susan L. Feller. Jim and I planted the garden seeds today. Now we feel like survivalists again. Looks like much better starter soil than last year, first step. It will be up to Mother Nature to help us get the plants growing when we put them in late in May. Until then the kitchen is our incubator. Put in three dozen pips of RAMPS two weeks ago in the woods. Got them from Ramp Farm Specialists, the only place selling Ramps as bulbs or seeds. Although these delicious alliums have a mystique of being only found in the mountains of Appalachia, we have found them growing in New Jersey and learned they are prolific in Colorado and many other areas. An acquired taste, one chef we met says a ramp needs to be “tamed” like a colt. Boiling and throwing off the water once takes the extra bite out of them. To promote our heritage I have branded my jewelry line R.A.M.P.S. “Rag Art Means Personal Style”. This entry was posted in appalachian food, farm life, jewelry and tagged farm life, self-sufficient, west virginia on March 12, 2011 by Susan L. Feller. October 16th dawned a beautiful FALL day. 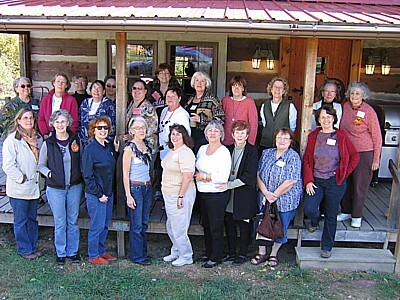 By noon 22 members and guests of the Mountain State Fiber Artists had arrived at Ruckman Mill Farm. They unloaded with desserts and salads (note the desserts were listed first, and were the most in both categories contributed). And also brought along finished hooked , needle work and quilted, items which were displayed on the front porch during our show and tell. We have accepted the ATHA challenge to make a 9 x 12 mat inspired by the color RED. Completed pieces will be shown at the Morgan County Fair next August and then contributed by members to the ATHA Bi-Ennial in Lancaster, PA October 19-22 to benefit the Education Committee. 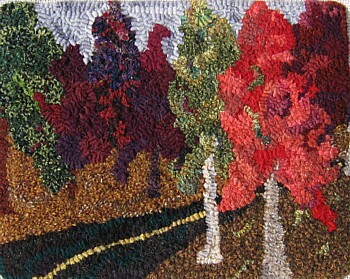 This entry was posted in farm life, Fiber Musings, hooked rugs, Meetings and tagged atha, farm life, fiber artists, fibers, hooked rugs exhibit, rug hooking on October 23, 2010 by Susan L. Feller. Sometimes you need to get away from a regular routine. Jennifer Larmour thought that a few weeks ago and called us up. Seems New York City in the summer gets hot ?! Determined to travel approximately 320 miles using “public transportation” she caught the Mega Bus from NYC to DC, walked the few blocks to Union Station and AMTRAC to take the 55 mile trip out on the ONLY train going west through Harper’s Ferry, WV on Saturday. That is where I came in, completing her trip out to Hampshire County in our Toyota (another hour and 45 minutes). 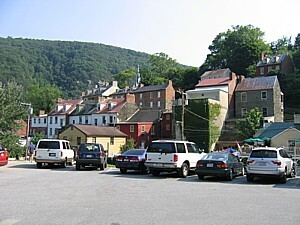 You see I wasn’t going closer than Harper’s Ferry to pick her up. More on the return trip later. Jim had planned on Jennifer’s visit food wise, shopping at the Romney Farmers Market for fresh snap peas from Bryan Beveridge, cooking up Bob (the rooster in previous post) into broth for Greek Lemon Soup (cold), and marinating some venison from the property till very tender for delicious kabobs with new red potatoes (Bryan’s again) cherry tomatoes and mushrooms (did have to resort to FoodLion for these). We started every morning with farm fresh eggs collected eagerly by Jennifer and served fried on a bowl of oatbran bought in bulk at Miller’s Market, or with bacon and greens from our garden. Sure is nice to have someone around who enjoys food and preparing it well. Jennifer and I did appreciate Jim. We enjoyed her visit and she stepped in willingly to help with our chores. The big team effort was harvesting the garlic rows before the 90 degree sun got too high in the sky. 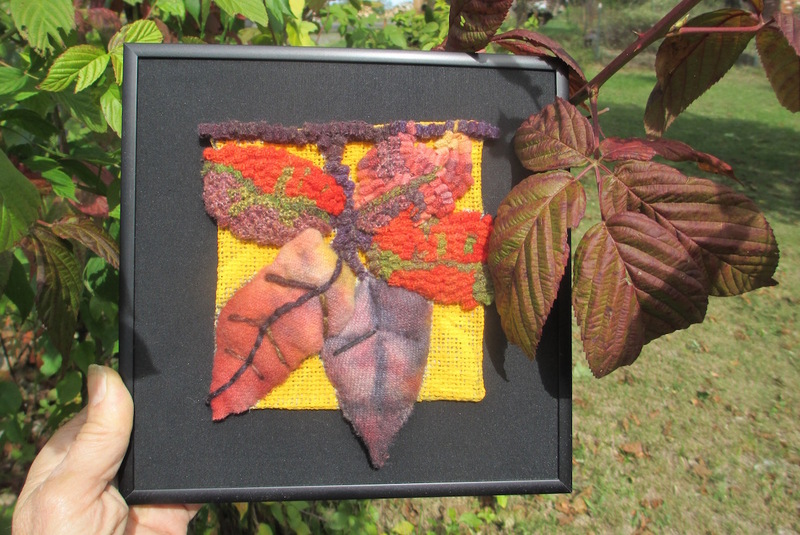 A fellow fiber artist, Jennifer and Susan spent hours happily working in the studio. She finished a portrait of Grandma with very young Jennifer on her lap. The freedom of interpretation is one aspect of her art we truly enjoy. Tuesday came too soon and we returned to Harper’s Ferry in time for the 11:16 am to DC, coming from Chicago. When the temperatures get as hot as currently, the trains slow down for safety reasons. Someone called the 800 number and found out the arrival would not be until 1:45!! TOO Late for a bus transfer in DC to NYC, we thought about it and agreed to take David (Appalachian Trail hiker who needed to get to a plane for return to Portland, OR) and off we went to Vienna METRO Station about 38 miles closer to the city. Thank heavens for the GPS and my knowing something of the area. Traffic picked up, the lanes widened to 5 lanes across at one point, but we were in the middle of the dayso not bad. Pulled into the station, and the travellers had decided to take a cab which would assure them of a quicker arrival in town, WALL-AH a Yello Taxi appeared! Received an email from Jennifer around 9:00 pm and she had arrived safe, having consumed a pound of snap peas on the bus trip. We look forward to another effortless, and very friendly visit soon. The farm isn’t the same without her, Bob, the cat, misses the extra attention. This entry was posted in farm life, Fiber Musings and tagged chickens, farm life, fibers, rug hooking, self-sufficient on June 26, 2010 by Susan L. Feller. Yes there are 3 Hens in the one box! 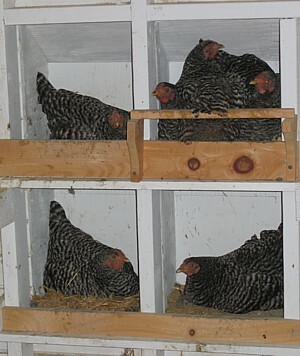 These Dominique Hens are fourteen months old. They obviously are interested in sitting on eggs to hatch. BUT they don;t understand, only one hen is needed per nest. We have patiently waited 22 days and are about to throw out the rotten eggs in upper right box and start all over AGAIN. The hen is not demonstrative enough to say, “Go Away, I have enough eggs under me, find your own spot to lay an egg.” What do we humans know about making baby chickens? Not much. 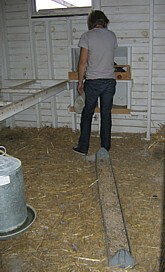 This entry was posted in farm life and tagged chickens, farm life, self-sufficient on June 13, 2010 by Susan L. Feller. 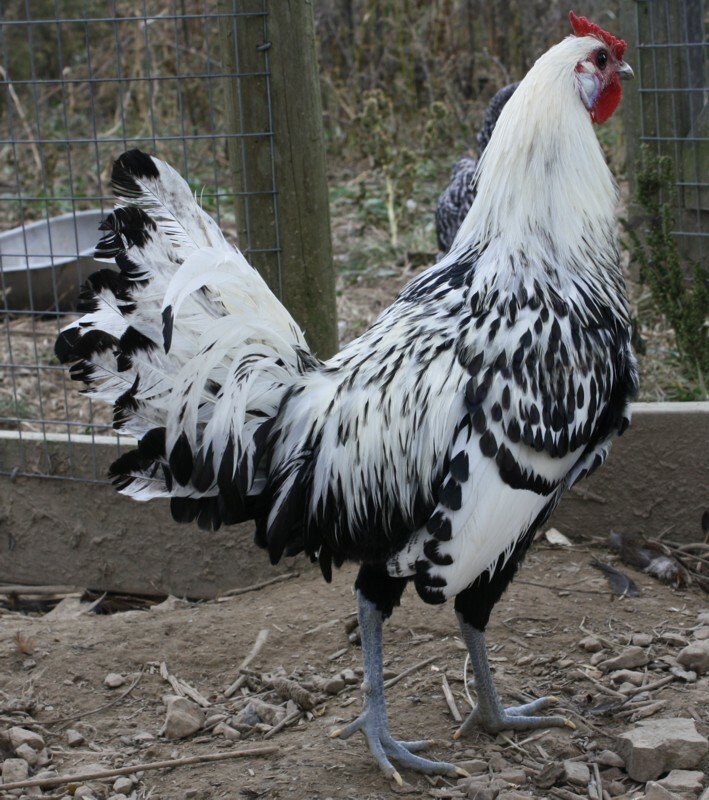 Two roosters are good for some things: breeding and two part harmony in the morning. But when Alpha male decides he is the king of the the roost (and the humans are considered part of that roost), something has to happen. Sure enough even though Jim thought the crown of Bob #1, was better than Bob #2, we finally decided to add #1 to the freezer. 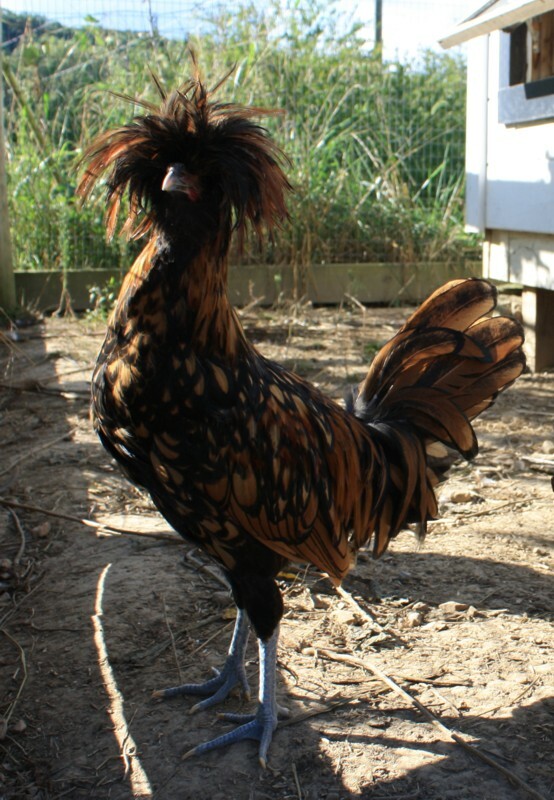 On April 22 the tenth rooster of the original Murray McMurray Dominques met his end. He was the first one we successfully plucked (since he was midway through a molt) and weighed in at 5 pounds dressed. The local farmers said that was a good size. We noticed the very next day a new quiet and calm nature to the flock including protective BOB. Glad he is happy we are too. Now to await the hatching of the first (of three) nests and another generation of hens and roosters named…. BOB. Wondering why all of our animals are named BOB? Makes for simple conversation, ease in culling the flock(they are all the same name) and we wont forget their name. 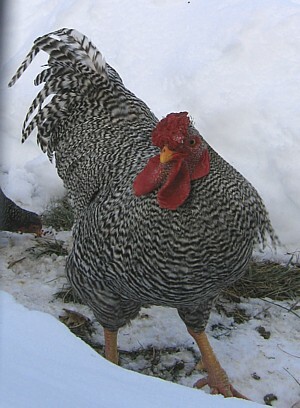 This entry was posted in farm life and tagged chickens, farm life, self-sufficient on April 26, 2010 by Susan L. Feller.